Eastern Wharf | Inspired by our past. A vision for our future. It’s impossible to imagine Savannah without our beloved river. The heart and soul of our community for generations. It’s given us commerce. Shaped our culture. Defined our character. And today, we’re proud to be creating something entirely new and special on the river’s edge. A warm, welcoming and walkable 54-acre gathering place with community parks and abundant greenspace. Wonderfully curated shops and restaurants. Modern office spaces. Luxury hotel rooms. Beautiful riverfront residences – a first for the city. All perfectly designed to reflect our proud architectural and cultural heritage. To be as soulful, authentic, vibrant and uniquely Savannah as possible. And to seamlessly connect with and complement everything we love about the Historic District. We’re calling it Eastern Wharf, an homage to the location’s rich industrial past. We think it says some truly great things about our future. In the early 1800s, the area commonly known as the Eastern Wharves District was a thriving hub of industry. Home to businesses such as A.N. Miller’s Foundry, Hydraulic Cotton Press Company and the Bullock and Winton Steam Saw Mill., the area saw decades of prosperity that played a key role in the state’s economic growth. And while the wharves eventually gave way to industrial progress, the legacy remains. Today, “Eastern Wharf” promises to once again be a hotbed for activity along the water’s edge. Historically grounded. Geographically descriptive. Simple and unadorned. Yet full of nostalgia that is so uniquely Savannah. It’s an inspired name we can all embrace. Fully embodying the city’s distinct personality and charm, Eastern Wharf seeks to embrace the established while also creating something completely new and dynamic. Giving residents, business owners, and visitors alike a forward-focused destination to take us all into the future. Embracing the river and all it means to our shared way of life—from industry and commerce to recreation and river-gazing. Eastern Wharf will offer a way to experience our beloved waterway like never before. Honoring our roots as the “Hostess City of the South”. Ambitiously designed to conjure effortless engagement and graciousness, you’ll feel this unique spirit throughout every touchpoint at Eastern Wharf. Powering off the laptop. Putting down the smartphone. Turning back time to when “social” meant genuine, face-to-face contact. Perhaps as much as anything else, our goal is for Eastern Wharf to be synonymous with connecting people. With a meticulous approach to design and programming, Eastern Wharf will have a special energy and way of bringing people together through the artful use of space, color and light that will help the place feel as vibrant as the community. And of course, finding a way to marry it all with the river to maximum effect. 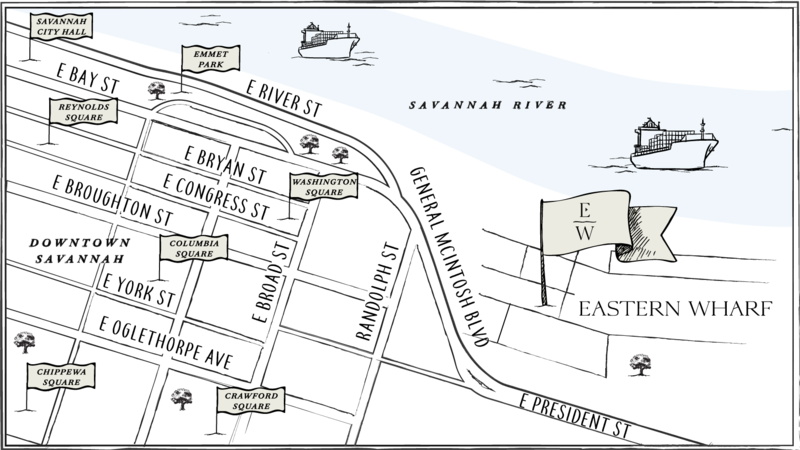 While this destination has been thoughtfully designed to marry seamlessly with the historic district, Eastern Wharf represents a bold step forward for all of Savannah. From technology and transportation to the careful consideration of energy and the environment, the progressive nature of it all will be undeniable. Our aspiration for Eastern Wharf is to create a community so extraordinary that it transcends the architecture and captures a truly unique sense of place. To give people experiences—in sight, sound, taste, touch and feel—that leave a lasting, inspiring and even poetic imprint. Images and renderings displayed on this website are artistic interpretations, representative of the vision for Eastern Wharf. © Copyright 2019 Eastern Wharf.